Papua New Guinea is doing away with the Outcome Based Education (OBE) and now implementing the Standard Based Education (SBC). 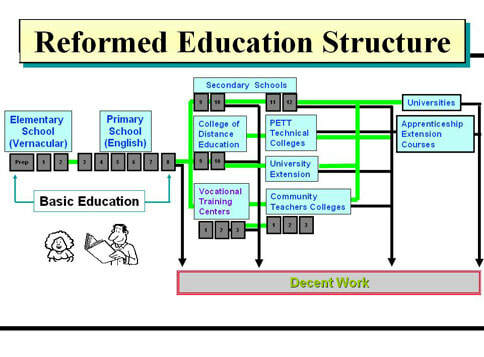 Below is the pictorial diagram of the SBC Structure. Below is the list of Resources recommended for Standard Based Education (SBC) for Elementary in Papua New Guinea. 5. English Teachers Guide scripted lessons for Elementary Prep. To improve education standards, the department of education is introducing a standard based curriculum in schools from 2015. This is the third in a series of media releases to raise awareness of the curriculum changes it explains. - The introduction of English as a compulsory subject in elementary schools. Almost all of our children are learning English as a second language, so English syllabus will build from the language they speak at home, children need to develop knowledge of English at an early age as English is the medium of instruction in the education system in PNG. English has been the medium of instruction for many years but the fluency of most teachers is not good enough and the often use Tok Pisin and local languages to explain English words or statements. The department of Education is encouraging elementary teachers to upgrade their teaching qualifications to a diploma level so that they can use English to the expected standards. The result of the Early Grade Reading Assessment (EGRA) in Papua New Guinea showed that children are not learning basic reading and writing skills. EGRA recommended the use of scripted lessons the teaching of phonics and greater student access to reading materials. Scripted lessons are lessons that are written out for teachers to use on each day of the school year. The lessons are in numbered steps and for each step the teachers are given the information they need and some activities such as songs, games, and stories. Teachers can build the lessons using their own skills and creativity. The daily scripted activity will improve the standard of English teaching and reduce teachers planning workload. English will now be taught as a subject in the elementary classes (EP, EP1 and EP2) in schools starting in 2015. This is a government directive through the task force report and the intention is to raise standards in literacy. It is important for students to learn English as a subject with Phonograms (sounds), syllables, vowels, nouns, verbs, pronouns, adverbs, adjectives, and formation of letter shapes, use of punctuations and writing sentences and stories creatively. The new syllabus uses phonics to teach English. Phonics is one of the important skills children need to learn to read and write. Children are taught to sounds and make sounds. They learn that words can be broken down into sounds and that those words can be written to read and build words. Some common words cannot be broken down. To be able to read simple sentences, children need to be able to some of the words by sight such as the “I”, “you” and “go”. These are called sight words. Phonics allows children purposely to master reading skills at an early age, by developing sound awareness, word identification, fluency and vocabulary and text comprehension. Research has revealed that children who used phonics early were not only able to speak, read and write efficiently in English they also performed academically well in most if not all of their subjects right from the beginning. Phonics also helps teachers. English is a complicated language. It has 26 letters and 42 sounds (phonemes) and over 120 different ways to write those sounds (graphemes). For example, /f/ can be written as f, ff, ph and gh, as in ‘fish’, coffee ‘Phillip’ and rough. Each elementary school week will have a theme accompanied by three songs supplied. The songs are on a micro-SD card that teachers can play on mobile phones or boom boxes. The ‘songs’ words and related activities will be written out in the lessons. It may be too soon for the children to sing alone, but letting them listen to sounds in English is important. Sound stories let the children become familiar with English sounds as they read them. They contain the songs learnt in that week. To teach the sounds in words, teachers will add ‘sound dots’ under sounds of words that they can write down for children to copy. For example ‘cat’ will have three sound dots: c.a.t. ‘Fish’ will also have three dots, because the ‘sh’ is one sound: f-i-sh. The children will learn to blend the sounds together into a word as the teacher says the sound and the words. With a few more sounds, children will be able to read and write simple phrases like “ the cat and the dog sat on the mat”. Besides the words they will sound out, the children will also learn common sight words. Real stories will then be introduced. Under the previous curriculum, three subjects – language, cultural mathematics and culture and community – were taught in elementary schools. English was taught as part of language. It will know be taught as a separate subject and there will know be 4 subjects. Due to the increase from three subjects to four and the raise standards in literacy and numeracy elementary classes will finish their daily lessons at 2pm instead of 12pm. THE Department of Education will introduce the new Standards-Based Education (SBE) curriculum in 2015 replacing the much-criticised Outcomes-Based Education (OBE), Education Minister Nick Kuman says. In his official report to Parliament, Kuman said in preparation for the SBE, the department would conduct awareness and provide in-service training to all teachers at the elementary and lower primary levels from Grades 3-5. Kuman said the officers from the Curriculum Development Division had been working tirelessly over the last six months to develop the SBE curriculum. He said in 2011 the National Executive Council had directed the department to review the OBE and a task force took to the task immediately. One of the main causes of the OBE being a failure was due to the concept was conceived by outside experiences and was difficult to use and manage the system at the national and sub national level, Kuman said. In addition there were inadequate planning and resources to support the full implementation of OBE. The majority of the teachers did not fully understand the conceptual framework of OBE. To address the situation, the government, Education Department and the stakeholders will now work together to ensure that mistakes of the past are not repeated when implementing the new curriculum, he said. “The government needs to continue to invest heavily over the coming years to ensure that the curriculum is fully developed with appropriate teaching materials, teacher training and sufficient amount of awareness are raised with all stakeholders,” he said. Kuman said the education system of PNG was comprised of about 13,000 institutions enrolling 1.9 million students with 48 teachers in the basic and post-basic education. He said the growth and participation in all levels of the education sector had been remarkable since 2000. The gender equity in access to education had been achieved since 2007 and there was an emerging evident of improvement in the gender parity. The national government has been able to use recent economic growth to increase investment in education. Although improvements can be seen in the system, a further increase in investment will be required to achieve education development goals. Beginning in 2012, the Peter O’Neill-led government’s tuition fee free (TFF) policy has provided education access to all children in PNG and there has been a 40 % growth enrolment since 2012, Kuman said. What are the principles of the PNG standards based curriculum? Everything teachers plan for teaching and assessing should be clearly focused on what students should be able to know and do. These expectations are expressed in the content standards, students’ performance standards and bench marks. The principle of high expectation is about insisting that work be at a very high standard before it is accepted as completed and achieved. Opportunities should be provided for students to work towards reaching the set standards. In a standards based curriculum, the national content standards are designed for all students throughout the country regardless of the context. These standards are clearly outlined in the syllabus. It is up to individual schools, classes and teachers to plan how these standards can be achieved. A national assessment and monitoring tool will be used to assess, monitor and evaluate the success of the students’ attainment or achievements for the set national and content standards. The SBC will target the empowerment of rural, urban, average and intellectual population. It allows flexibility to accommodate both able and disadvantaged to discover their potential in order to pursue their interest through the learning standards set in the curriculum. It establishes clarity about the standards we expect our young people to achieve so that they can compete confidently with the best of their peers globally. Learning is progressive. What are the implications of Standards Based Curriculum? assessment tasks which are integrated within the learning-teaching-assessment process and do not consist of only the final product. How do we assess standards? When working with standards, the assessment system needs to be consistent with what is being tested. Comparing a pupil’s performance with other pupils is known as norm-reference assessment and pupils can be assessed against a standard (criterion- referenced assessment). Assessment is viewed not only as a final product (summative), but also as a continual process (formative) and provides pupil performance data to teachers and students regarding their progress towards achieving the standards. This shift to standards- based assessment helps create ‘a culture of success,’ where all pupils can achieve an acceptable level. The curriculum sets benchmark levels of pupils’ achievement and progress towards meeting the standards by describing what the pupils can do with particular areas of learning such as language. So, it is necessary to move beyond testing methods which concentrate on memory, and develop those which measure understanding and application (Genesee, et.al., 1998; Winters, 1995). In order to assess if pupils have achieved the different benchmarks, they are expected to demonstrate what they can do, by applying what they know to real-life situations. What is Bench marking in Education? Standards show what students should know at different levels of their school life. Examinations measure student progress towards attaining the standards. · Equal opportunity for the students. All the students are compared to the same standards. · Expectations of what all pupils should know and be able to do are clear. · A higher level of achievement, while being realistic and relevant to the context in which they are being taught. Papua New Guinea has implemented Standard Based Education in the Education System. This page enlightens some of the questions about SBE.